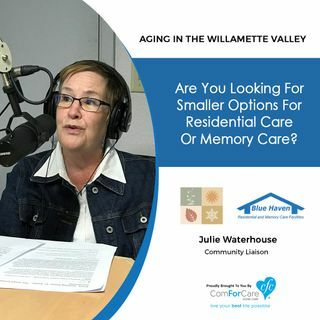 6/19/18: Julie Waterhouse with Four Seasons & Blue Haven | Are You Looking For Smaller Options For Residential or Memory Care? During this episode, we discuss residential care (which is similar to assisted living) and memory care at Four Seasons & Blue Haven. These communities operate on a much smaller scale than the large buildings you may have seen before. Julie Waterhouse, Community Liaison, tells us why a smaller setting is better for some people and what makes these communities different from their larger contemporaries.